Uphill, downhill, the KTM Macina Fogo can handle it all. Gravity casting methods to create the motor housing means a more precise production method, more integrated system and ultimately provides a more rigid frame. This KTM Macina Fogo uses the latest production methods like hyrdo-forming, drop forging, CNC processing and gravity casting. 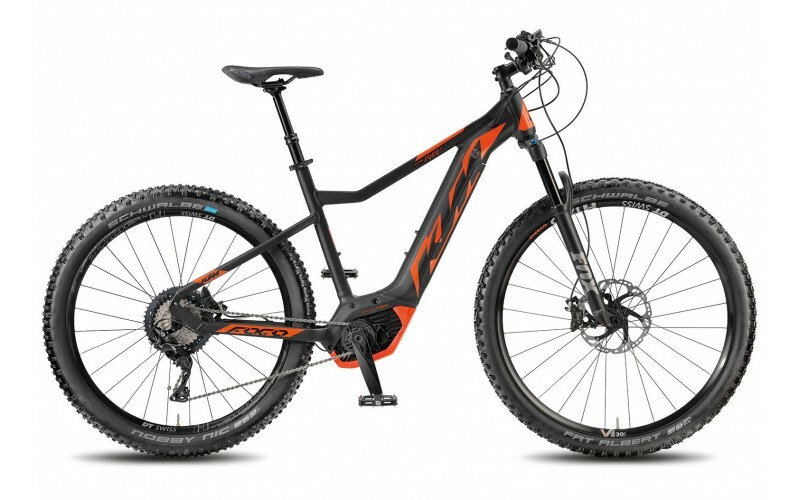 The Fogo 271 represents a top specification eMTB. With Fox Float 34 suspension forks, Bosch Performance CX system and special Dimmix tyres, this eBike is optimised for performance riding. One of the standout new features on the Macina Fogo is the DiMMiX wheels. This mix of dimensions features a 29” front wheel for improved handling, with a rear 27.5”+ wheel for more traction on the uphill flow. Both tyres feature the same external dimensions, meaning you don’t have to compromise on cornering. The front wheel is fitted with Schwalbe’s Fat Albert, while the rear is boasts a Nobby Nic. Up front, Fox 34 A Float forks add to the performance and comfort of your ride. As previously stated for such an extreme bike, only the highest spec motor could be fitted. Therefore the Macina Fogo 271 features the Bosch PerformanceLine CX motor with its 75nm of torque. While riding in ‘Turbo’ you will feel as much as 300% assistance, which will take you further than most out riding the trails. The Intuvia display also allows you to choose EMTB mode, providing between 160-300% assistance.